Having a MacBook means that you can’t go blending in with the rest of the world, it’s just against the rules. 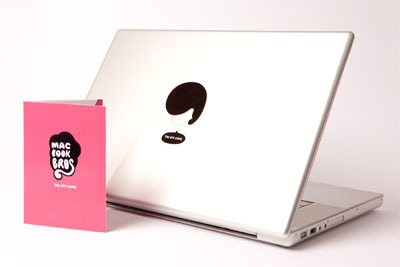 Should you want to perk up your MacBook a little, you can give it some personality with these stickers. There is a wide range of them, but each one makes your Apple logo look like a man’s head. Sorry, there are no female versions, but if you like your mustaches then you’ll have plenty to look at. Unfortunately, my little plastic Apple has seemed to have popped apart on the inside of my laptop, so if I did this it’d make things look a little strange. Should your Apple be in a bit better shape than mine you’ll have the Bros and Mos collection to flip through. There are a total of 16 different choices and half of those are purely mustaches. You can purchase these for 8 Euros through Stick With Me Baby or about $9.50.